GENEVA, Switzerland -- Fighting in eastern Ukraine has eased recently, but at least 6,417 people have died in the conflict and abuses that may amount to war crimes continue to be committed by both sides, the United Nations said Monday. 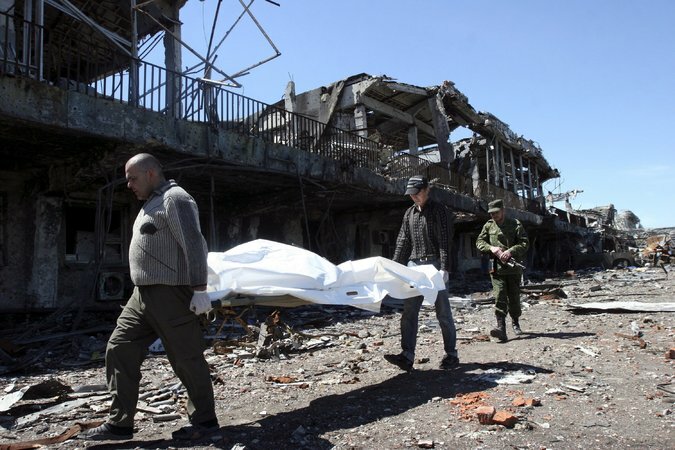 Remains of soldiers killed in fighting between Ukraine and pro-Russian separatists being removed from the airport in Donetsk, Ukraine, in May. Nearly 16,000 people have also been injured since fighting broke out between Ukraine and pro-Russian separatists in the region in April 2014, Ivan Simonovic, assistant head of the United Nations human rights office, told reporters in Geneva in presenting the latest report of its monitors. The casualty estimates were conservative, Mr. Simonovic emphasized. Both sides have reported that hundreds of people are missing, and morgues in the contested areas reportedly hold hundreds more bodies, the report said. Indiscriminate shelling and the number of civilian casualties from the fighting have fallen since February, but “the shelling has not stopped, nor have armed hostilities between Ukrainian armed forces and armed groups, meaning that civilians continue to live in fear,” the human rights office said in a statement released with its report, which focuses on developments in the three months to May 15. Moreover, there are reports of “horrific accounts of torture and ill-treatment in detention” by both sides, Zeid Ra’ad al-Hussein, the head of the human rights office, said in a statement. “We have documented alarming reports of summary executions by armed groups and are looking into similar allegations against Ukrainian armed forces,” he said. Those abuses, if proved in a court, would constitute war crimes, Mr. Simonovic said. “The withdrawal of foreign fighters and the cessation of the flow of weapons from the Russian Federation would have a significant impact on law and order” and on the implementation of the cease-fire agreements of Minsk, Belarus, the report said. The United Nations asked that priority be given to the clearing of mines and unexploded ordnance, which it said caused “considerable” numbers of casualties. It cited reports from the Ukrainian Health Ministry saying that at least 42 children had been killed and 109 wounded by mines and other explosive devices in the areas around Donetsk and Luhansk that have been controlled by pro-Russian armed groups since March 2014. The United Nations also expressed concern about the safety of journalists in Ukraine, reporting that a Ukrainian photographer who died in a mortar attack in February was the eighth journalist killed in the fighting. The monitors cited frequent reports of journalists being detained by armed groups and the death of the journalist Oles Buzyna, a well-known critic of the Ukrainian government who was killed by two masked men near his home in the capital, Kiev, in April.